We were thrilled to host Her Honour, the Honourable Lois Mitchell, CM, AOE, LLD, Lieutenant Governor of Alberta, and her husband, His Honour, Honourary Colonel Douglas Mitchell, CM, AOE, QC, LLD, at a luncheon to present the Social Studies Education Student Award to Brett Fawcett, and to recognize finalist, Domonic Lodge. Brett Fawcett graduated from the Bachelor of Education After Degree (BEd(AD)) Program this past May 2018. He will begin his teaching career in a Grade Three class in China this coming September. Brett earned this prestigious award because of his lesson about Premier William “Bible Bill” Aberhart and the Social Credit policies he presented during the Great Depression. Students were invited to compare Aberhart to Donald Trump as a way of understanding both populist figures better. The activity involved the students being given their own “Prosperity Certificates” to purchase chocolate bars, only to discover that the Certificates are worthless as purchasing power, since the province has no constitutional authority over money; that is a federal responsibility. The lesson not only encouraged students to use historical thinking but also to be informed voters. Domonic Lodge was a finalist for the Lieutenant Governor of Alberta Social Studies Education Student Award. Domonic was also the 2018 BEd(AD) Student of Year recipient. He was the Vice-President and President of the Education Student Society and played an integral role supporting his fellow students in the BEd(AD) program. Domonic selected the topic of Alexander Wuttunee “Alex” Decoteau for his lesson and designed it for a grade six level. Despite their drastically different childhoods, upbringings and cultures Domonic shared some core values, beliefs and experiences with Alexander Decoteau, which allowed him to retell this fantastic story with passion and enthusiasm. Two topics that sparked Domonic’s passion were that he and Alexander shared a love for athletics and they both served in the Canadian military. These connections created a lesson that Domonic hoped any audience could relate to on a personal level. Domonic was able to bring the past into the present and give this story new life. 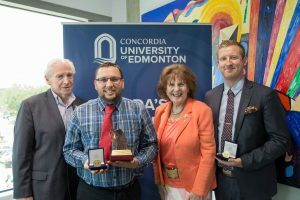 The Faculty of Education, and the whole Concordia community, congratulates Brett and Domonic on their thoughtful work in the BEd (AD) program and their well-deserved awards. We wish them the best in their future teaching careers.